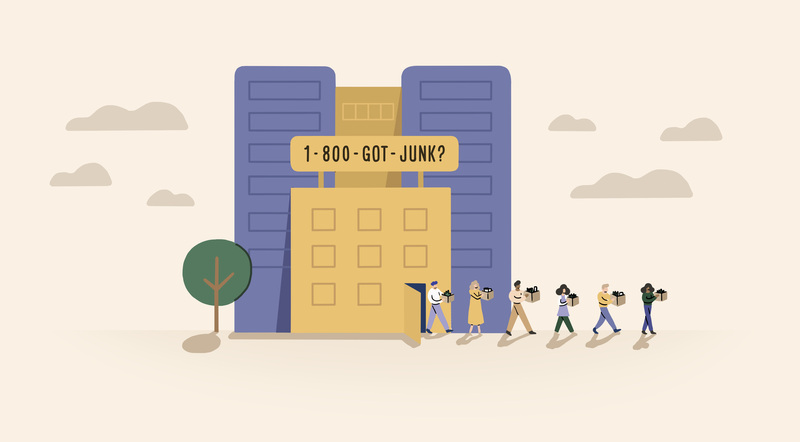 How Brian Scudamore Fired Everyone and Saved 1-800-GOT-JUNK? The following is Brian Scudamore’s story as told to Jared Lindzon, exclusively for Bench. In 1994 I was five years into running 1-800-GOT-JUNK?, earning half a million in revenue, and I wasn’t enjoying going to work anymore. That’s because I spent most of my day listening to complaints. Most of my staff of 11 complained constantly about having to work late, about the job, about the weather, about not making enough money; no matter what it was, there was a complaint, and it was bringing me down. I found myself hiding in my little office all day just to avoid them. I’d leave their paperwork out for them in the morning and then I’d shut the door, and they’d dispatch themselves out in the trucks. The people I had weren’t the most clean-cut or the most professional, but I put the blame squarely on myself. I wasn’t giving them the culture or the vision they needed to succeed. I don’t think I would have made the decision if I knew what I was getting myself into. There was a sense of relief when I ripped off the Band-Aid, but then I had to start the healing process. I didn’t know how long it was going to take to rebuild; in fact I don’t think I would have made the decision if I knew what I was getting myself into. All of a sudden I was alone, working crazy hours. I went from five trucks down to one truck that I operated on my own while rebuilding the business. Let Bench take bookkeeping off your plate. Hauling away junk without a partner in the truck helping you is really difficult. I remember one time I was called in to remove a cast-iron bathtub, and I couldn’t really do that on my own, so I had to get creative. I took out a sledgehammer and broke it up into big chunks and loaded it one piece at a time. In between hauling junk I also had to answer calls, book jobs and recruit new staff. I was the HR department, the junk removal department, and the call centre. Doing all of those jobs at once was a real challenge. All of the extra labour reinforced the importance of getting things right the second time around. I realized that as much as I loved being an entrepreneur, I couldn’t enjoy going to work everyday unless I genuinely enjoyed being around the people I employed. I began envisioning the company that I wanted to work for, and rebuilt the company around that vision. The first step in building the company I wanted to work for was hiring someone who would be like a friend; someone I could have fun with out in the trucks, someone I knew cared about customers in the same way that I did. Together we would define our values and our culture and what we were all about, and build the rest of the team around that. That person was Dave Lodewyk, and he was key in the rehiring process. He and I are still the best of buds, and go skiing together every chance we get. It was a huge shift when I found a person I wanted to spend time with, because even on the hardest days we could still have fun together. That became my mission in building this business. In the end it took six months to rehire, retrain, and get the right people in place, but once I was out of the thick of it I was able to see the difference right away. I was wearing a smile to work every day again, I was really enjoying what I was doing and I hired people I actually wanted to hang out with after work. As the business expanded from just me, to me and Dave, to the staff of 500 I have today, culture and attitude become a centrepiece of the company’s culture. The day I fired my staff was the last day I worked out of a private office, hidden away from the rest of the employees. Today we have an open culture, and spend a lot of time and resources ensuring that our staff have the support and encouragement they need to be successful. That attitude is true from the CEO to the office staff to the folks who work on the trucks. Our trademark as a company and the reason why people use us over our competitors isn’t because we haul trash better than anyone else. It’s because every customer is greeted with a friendly smile, and treated with respect. Firing my entire staff was the most monumental thing I’ve ever done in shaping the future of the company. We’re now doing a third of a billion dollars in revenue annually, but I only quote numbers to demonstrate the growth we’ve had. I’m really not a money guy who cares about expensive toys or fancy things. I just want to be surrounded by people who are doing meaningful work, and are having fun doing it. Firing my entire staff was the most monumental thing I’ve ever done in shaping the future of the company. We’re not perfect, and we’ve made hiring mistakes, but after that experience we started to hire differently. “Hire for attitude, train for skill” became the mantra. We look for people that smile, that are cheery, that have a glass-half-full attitude. We all have difficult things in our lives that we need to deal with, but we want people that face their problems with gratitude, a positive outlook and a passion for life. When I fired those 11 people I knew what I wanted the experience to be like for my future customers—I knew the sense of pride I would feel in running that kind of business. I didn’t know how I was going to get there, and it took six difficult months to build it. Looking back, I’m glad I was able to accept my mistake, and begin the process of building the company I’m happy walking into today. Brian shares more stories in his new book “WTF?! (Willing to Fail): How Failure Can Be Your Key to Success”. You can buy it here.